Posters popping up around town were designed by John Parker, who has done the artwork for several Radiators CD covers. A cannon shot won’t be the only sound that sends Hunter Thompson into whichever realm of the hereafter the late journalist’s spirit lands. Thompson will ride into the great beyond on a rush of Fish Head music.The Radiators, the New Orleans quintet that has been playing its brand of rock ‘n’ roll- dubbed Fish Head music – for 27 years, is dedicating tonight’s concert to the memory of Thompson. The Radiators play at the Belly Up, with fellow New Orleans musician Eric Lindell opening. John Parker, who has done the artwork for several Radiators CD covers, has made a special poster for the occasion. 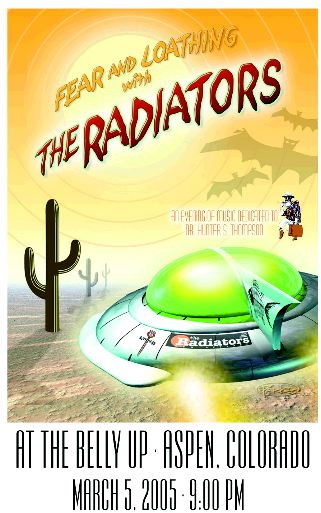 The poster, featuring the text “Fear and Loathing with the Radiators,” a spaceship landing in a desert landscape, and various Radiators and Thompson logos, should be scattered about town by now.The Rads, as they are known, would seem kindred spirits with Thompson. Especially so in the case of singer-keyboardist Ed Volker, a former English major at New Orleans’ Tulane University, who is an insanely prolific writer. Volker’s songs, like “If You’re Heart Ain’t In It (Get Your Other Part Out),” tend to have a lewd sense of humor. Volker, like Thompson, is known to issue a profound thought, though usually in a barely distinguishable mumble.And the Rads as a whole have, in the mold of Thompson, broken some rules. The band has managed to keep their quarter-century ride going, uninterrupted, with what singer-guitarist Dave Malone calls “the same five knuckleheads.” Apart from a short dance with Epic Records in the late ’80s, the Rads have been an independent project, existing outside the music business machine. “We pretty much do whatever we feel like doing, no matter what the consequences,” said bassist Reggie Scanlan by phone.Scanlan added that the Rads were honoring Thompson as “a revolutionary as far as journalists go. I would think any journalist today owes a lot to him for breaking down some walls.”The band doesn’t have anything special planned for the gig, number 3,680 or so in the band’s history. But Scanlan expects Thompson’s ghost will probably guide them to some unexpected corners.